مکاری, مهدی, قهرمان, بیژن, ثنایی نژاد, سیدحسین. (1394). بهینه کردن شاخص SAVI و برآورد تبخیر-تعرق واقعی با استفاده از تصاویر ماهواره‌ای لندست 8. نشریه آبیاری و زهکشی ایران, 9(3), 458-468. مهدی مکاری; بیژن قهرمان; سیدحسین ثنایی نژاد. "بهینه کردن شاخص SAVI و برآورد تبخیر-تعرق واقعی با استفاده از تصاویر ماهواره‌ای لندست 8". نشریه آبیاری و زهکشی ایران, 9, 3, 1394, 458-468. مکاری, مهدی, قهرمان, بیژن, ثنایی نژاد, سیدحسین. (1394). 'بهینه کردن شاخص SAVI و برآورد تبخیر-تعرق واقعی با استفاده از تصاویر ماهواره‌ای لندست 8', نشریه آبیاری و زهکشی ایران, 9(3), pp. 458-468. مکاری, مهدی, قهرمان, بیژن, ثنایی نژاد, سیدحسین. بهینه کردن شاخص SAVI و برآورد تبخیر-تعرق واقعی با استفاده از تصاویر ماهواره‌ای لندست 8. نشریه آبیاری و زهکشی ایران, 1394; 9(3): 458-468. برآورد تبخیر-تعرق واقعی در مواردی از قبیل برنامه­ریزی آبیاری، توازن هیدرولوژیکی، طراحی و مدیریت سیستم­های آبیاری و پیش­بینی میزان عملکرد محصول ضروری است. بنابراین پژوهش­گران بسیاری تلاش کرده­اند تا مقادیر تبخیر-تعرق واقعی را در مقیاس­های مختلف زمانی و مکانی به دست آورند. سنجش از دور از جمله روش­های جدیدی است که می­تواند بدین منظور استفاده شود. از این رو در پژوهش حاضر با بهینه کردن شاخص تعدیل خاک پوشش گیاهی (SAVI)، توزیع مکانی تبخیر-تعرق واقعی روزانه در بخشی از دشت مشهد با استفاده از تصاویر ماهواره لندست 8 در روزهای 19 خرداد، 4 تیر، 6 و 22 شهریور سال 1392 و به­کارگیری الگوریتم توازن انرژی سطح (سبال) محاسبه شد. نتایج نشان داد بین شاخص تفاضل نرمال شده گیاهی (NDVI) و تبخیر-تعرق واقعی در روزهای مورد مطالعه، همبستگی وجود داشت. از طرفی دیگر با توجه به اینکه انحراف معیار شاخصSAVI برای ضریبL=1 (فاکتور تصحیح اثرات زمینه خاک) کم­ترین مقدار خود را داشت، بنابراین می­توان گفت که مقدار بهینه L برای منطقه مورد مطالعه یک می­باشد. هم­چنین روند تغییرات تبخیر-تعرق مرجع مشابه تغییرات تبخیر-تعرق واقعی بود که این حاکی از آن است که پوشش گیاهی در اراضی کشاورزی منطقه مورد مطالعه از لحاظ دسترسی به آب مشکلی نداشته است. Actual evapotranspiration (ETa) estimation is a main factor for irrigation scheduling, hydrological balance, design and management of irrigation systems and crop yield prediction. Therefore many researchers have been tried to achieve ETa in different spatial and temporal scales. Remote sensing is one of the newest methods that can be used for this purpose. Therefore, In present study, spatial distribution of daily Eta at a part of Mashhad plain was estimated using Landsat 8 satellite images on 9 June, 25 June, 28 August and 13 September 2013. For this purpose, soil adjusted vegetation index (SAVI) was optimized for SEBAL algorithm. The results showed that there was a correlation between normalized difference vegetation index (NDVI) and ETa in study events. Also, standard deviation of SAVI was the least for L=1 (correction factor of soil background effects). Therefore it can be concluded that optimum amount of L for study region is one. Also the trend of ETr was similar to ETa. It can be concluded that plant cover in agriculture lands had no limitation for accessible of water in study region. پرویز،ل. خلقی،م. ولیزاده،خ. عراقی­نژاد،ش و ایران­نژاد،پ. 1389. ارزیابی کارایی شاخص تفاضل نرمال شده پوشش گیاهی (NDVI) از طریق پایش وضعیت پوشش گیاهی. همایش ملی ژئوماتیک. تهران. 19 تا 20 اردیبهشت. 9 صفحه. 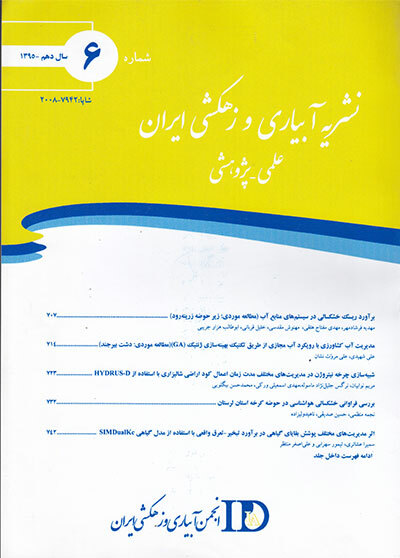 ثنایی نژاد، س.ح. نوری، س و هاشمی­نیا،س.م. 1390. برآورد تبخیر و تعرق واقعی با استفاده از تصاویر ماهواره ای در منطقه مشهد. نشریه آب و خاک (علوم و صنایع کشاورزی). 25 .3 :540-547. سازمان هواشناسی خراسان رضوی. 1383. بررسی وضعیت آب و هوایی استان خراسان رضوی. کاویانی،ع. سهرابی،ت و دانش کارآراسته،پ. 1392. تخمین بهره­وری آب کشاورزی در دشت قزوین با استفاده از تصاویر MODIS و AVHRR و داده لایسیمتر. مجله پژوهش آب ایران. 13: 1-10. مباشری،م. خاوریان،ح. ضیائیان،پ و کمالی،غ ع. 1384. برآورد تبخیر-تعرق واقعی با استفاده از تصاویر MODIS و الگوریتم سبال. همایش ژئوماتیک. تهران. 1 تا 2 اردیبهشت. 12 صفحه. محمود زاده،ح و ولیزاده،خ. 1388. کاربرد داده­های ماهواره­ای چند زمانه­ای و GIS برای ارزیابی کاهش مناطق زراعی در شهرستان اسکو. مجله فضایی جغرافیایی. 25: 9-24. Allen,R., Waters,R., Tasumi,M., Trezza,R and Bastiaanssen,W. 2002. Seabal, Surface energy balance algorithms for land, Idaho Implementation. Advanced Training and Users Manual, version 1. 0. Almhab,A and Busu,I. 2008. Estimation of evapotrnspiration with modified SEBAL model using Landsat-TM and NOAA-AVHRR images in arid mountains area. Second Asia International Conference on Modeling & Simulation, Kuala Lumpur,Malaysia, 13-15 May. Bannari,A., Morin,D., Bonn,F and Huete,A.R. 1995. A review of vegetation indices. Journal of Remote Sensing Reviews, 13: 95-120. Baret,F., Jacquemoud,S and Hanocq,J.F. 1993. The soil line concept in remote sensing. Journal of Remote Sensing Reviews, 7: 65-82. Bastiaanssen,W.G.M. 2000. SEBAL based sensible and latent heat fluxes in the irrigated Gediz Basin, Turkey. Journal of Hydrology, 229: 87-100. Bastiaanssen,W.G.M., Menenti,M., Feddes,R.A and Holtslang, A.A. 1998. A remote sensing surface energy balance algorithm for land (SEBAL): 1. Formulation. Journal of Hydrology. 212-213: 198-212. Bastiaanssen,W.G.M., Noordman,E.J.M., Pelgrum,H., Davids,G., Thoreson,B.P and Allen,R.G. 2005. SEBAL model with remotely sensed data to improve water-resources management under actual field condition. Journal of Irrigation and Drainage Engineering, 131.1: 85-93. Bausch,W.C. 1993. Soil background effects on reflectance-based crop coefficients for corn. Journal of Remote Sensing of Environment. 46: 213-222. Elvidge,C.D and Chen,Z. 1995. Comparison of broad-band and narrow-band red and near-infrared vegetation indices. Journal of Remote Sensing of Environment, 54: 38-48. 1Franks,S.W and Beven,K. 1999. Conditioning a multiple patch SVAT model using uncertain time-space estimates of latent heat flux as inferred from remotely sensed data. Journal of Water Resources Research.35.9: 2751-2761. 1Gao,Y., Long,D and Li,Z.L. 2008. Estimation of daily actual evapotranspiration from remotely sensed data under complex terrain over the upper Chao river basin in North China. International Journal of Remote Sensing. 29:11. 3295-3315. 1Hafeez, M.M., Chemin,Y., Van De Giesen,N and Bouman, B.A.M. 2002. Field evapotranspiration estimation in central Luzan, Philippines, using different sensors: Landsat 7 ETM+, Terra Modis and Aster. Symposium on Geospatial Theory, Processing and Applications, Ottawa. 2Huete, A.R. 1988. A soil-adjusted vegetation index (SAVI). Journal of Remote Sensing of Environment. 25: 295-309. 2Leprieur,D., Verstraete,M.M and Pinty,B. 1994. Evaluation of the performance of various vegetation indices to retrieve cover from AVHRR data. Journal of Remote Sensing Reviews, 10: 265-284. 2Opoku-Duah,S., Donoghue,D.N.M and Burt,T.P. 2008. Intercomparison of evapotranspiration over the savannah Volta Basin in West Africa using remote sensing data. Journal of Sensors. 8: 2736-2761. 2 Qi,J., Chehbouni,A., Huete,A.R., Kerr,Y.H and Sorooshian, S. 1994. A modified soil adjusted vegetation index. Journal of Remote Sensing of Environment. 48: 119-126. 2Rondeaux,G., Steven,M and Baret,F. 1996. Optimization of soil-adjusted vegetation indices. Journal of Remote Sensing of Environment. 55: 95-107. 2Singh,R.K., Irmak,A., Irmak,S and Martin,D.L. 2008. Application of SEBAL model for mapping evapotranspiration and estimating surface energy fluxes in South-Central Nebraska. Journal of Irrigation and Drainage Engineering. 134.3: 273-283. 2 Seevers,P.M and Ottmann,R.W. 1994. Evapotranspiration estimation using a normalized difference vegetation index transformation of satellite data. Journal of Hydrological sciences. 39.4:333-345. Shahzad,S and Iftikhar,A. 2008. Determination of daily regional scale actual evapotranspiration for Indus sub basin using Landsat ETM+. Pakistan Journal of Meteorology. 4.8.:49-58. Szilagyi,J., Rundquist,D.C., Gosselin,D.C and Parlange,M.B. 1998. NDVI relationship to monthly evaporation. Journal of Geophysical Research Letters. 25.10:1753-1756. Tasumi,M., Trezza,R., Allen,R.G and Wright,J.L. 2003. U.S. validation tests on the SEBAL model for evapotranspiration via satellite. ICID Workshop on Remote Sensing of ET for large Regions, 17 Sept.
Teixeira, A.H., Bastiaanssen,W.G.M., Ahmad,M.D and Bos,M.G. 2009. Reviewing SEBAL input parameters for assessing evapotranspiration and water productivity for the Low-Middle Sao Francisco River basin, Brazil, Part A: calibration and validation. Journal of Agriculture and Forest Meteorology.149: 462-476.